They are so easy, festive & fun. I knew we had to make some shamrocks for our windows. The Lil Divas are getting more and more creative with their designs. the more fun your pattern is! it's a surprise every time! 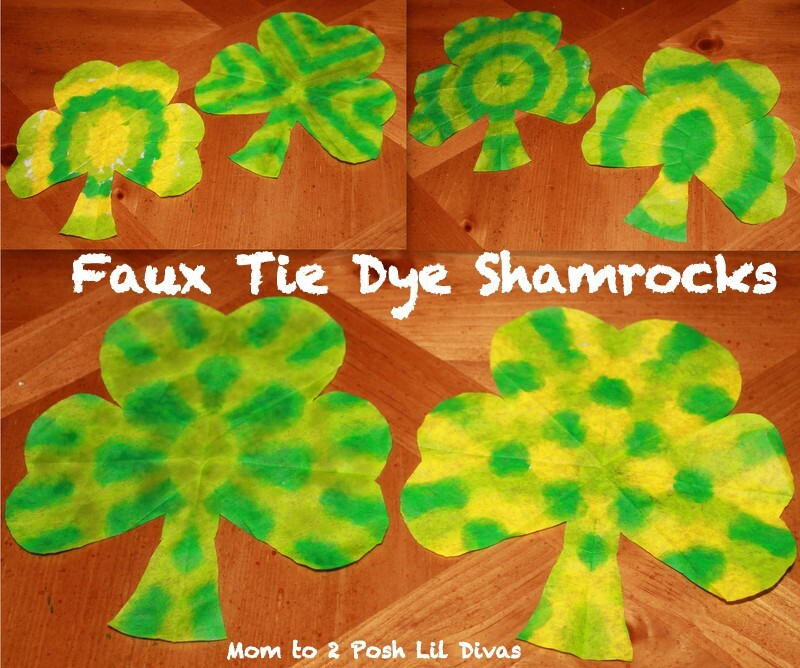 3. make your pattern - let the kids go crazy & see what they get! Try folding it different ways and see how it changes your patterns. so the color goes through all the layers. 4. Open it up and behold your tie dye pattern. We have some awesome patterns. I'm excited about displaying these on our windows! Very cute! 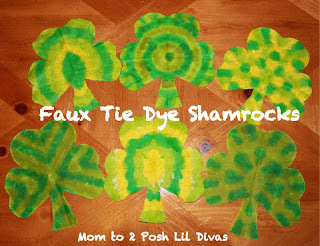 My kids love making these too! 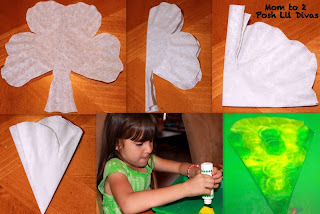 My kids love doing these to, and they are such a nice decoration for the windows! Thanks for sharing! yes! I love putting them on the window - they look fabulous! Ohhhh I love these - very cute and very lucky also a great way to get a tie die effect. Will have to have a try at some. Love this idea!!! Must pin! Pinned! We will be doing this! 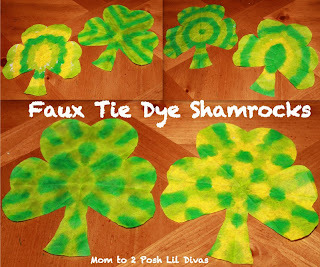 I've been looking for an easy/not too simple shamrock craft for my littles to do. Thanks for sharing! 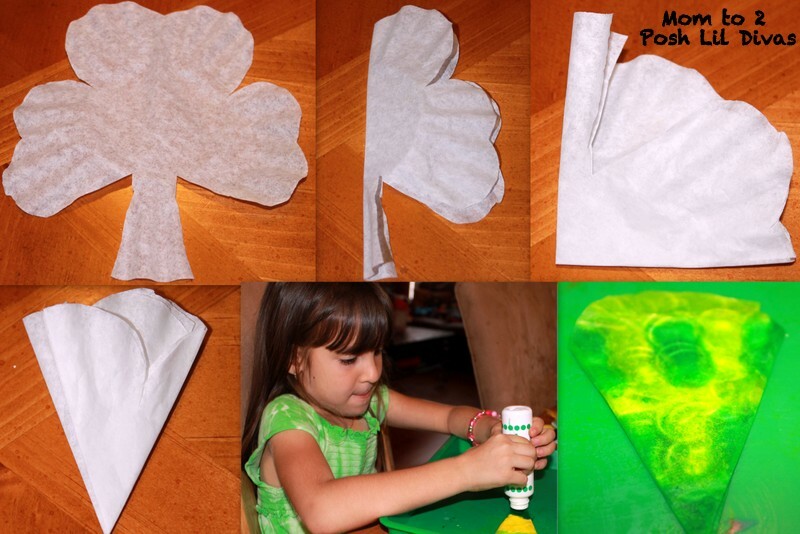 this is easy & fun - my girls love banging on the paper :) and then uncovering the design they made! I like that you can get such different looks. Thanks for stopping by. I really think these are neat. I can't wait to try this with my girls. I'm pinning it! I love this idea....you have some great things on your site. I am a SAHM teaching my kids and just started a page and blog. Would love for you to follow me. Would you tell me about using markers and alcohol? Do you just use the markers and then paint the alcohol on top? Thanks! These are really cute!! Great craft for the book too. Thanks for sharing at AfterSchool. How fun! We should try these with our dot markers. cute. I do this for other holidays in preschool- but we just use crayola markers and water in a squirt bottle. I have those dots- love the idea of that :) Thanks for sharing! Super cool and fun! I just might have to do this with my girls! Thanks for linking up to Fun Stuff Fridays! I love these!! We will definitely have to give them a try. Thank you for sharing at Sharing Saturday!! I hope you will share with us again this week! Oooh these are PRETTY. Just so fresh and Spring like. Love this project. I can't wait to try it with my preschoolers!! Well, well, well- aren't you cleaver? 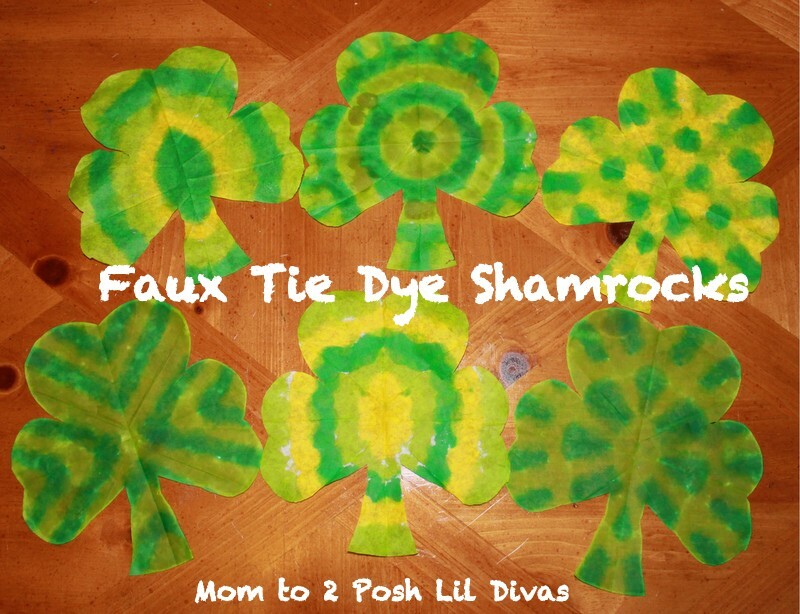 A simple, fun, and relatively mess-free craft! AWESOME!!! I made these with my class this week. They are currently hanging on our blinds and move sharing with the breeze. Thank you for sharing.